Commander John C. Ball, a native of Fairview Park, Ohio, graduated from the U.S. Naval Academy in 1971 with a B.S. in Aerospace Engineering. He served six months aboard USS Wichita (AOR-1) off Vietnam prior to flight school. Upon earning his wings in January of 1973, John served with squadron HC-6 in Norfolk flying the H-46 Sea Knight helicopter on two Mediterranean deployments. He earned a M.S. in Aeronautical Engineering from the Naval Postgraduate School in Monterey, followed by a tour with HC-11 in San Diego as Officer-in-Charge on a WESTPAC deployment. 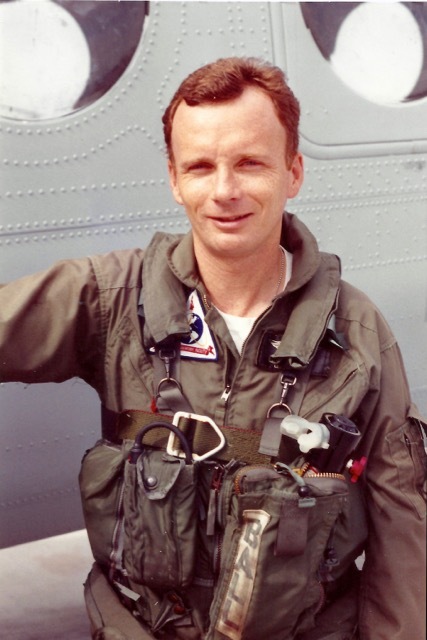 In 1980, John was selected for Aeronautical Engineering Duty Officer and attended the Rotary Wing Course at the U. S. Naval Test Pilot School, graduating with distinction in 1981. At Pax River, John travelled extensively while testing H-46, H-1, and TH-57 helicopters. As Project Officer for the Bell XV-15 Tilt Rotor Research Aircraft, he made the first ship landing of a tilt rotor aircraft during the XV-15 shipboard evaluation aboard USS Tripoli (LPH-10) in 1982 off San Diego. He served at the Naval Plant Representative Office at Sikorsky Aircraft as Program Officer where he flew government acceptance flights on new Army UH-60A, Navy SH-60B, and Marine CH-53E helicopters. He returned to San Diego as Engineering Officer at the Naval Aviation Depot, North Island, and flew post-overhaul check flights on H-46 helicopters. In 1989 he became the second editor of NHA’s “Rotor Review” magazine for two years. His final tour was on the AIRPAC staff as Helicopter Engineering Class Desk, retiring in 1991. During his Navy career, John became a member of the Society of Experimental Test Pilots and was a 1987 NASA finalist for astronaut mission specialist. In 1991 John joined Bell Helicopter in Texas as an experimental test pilot where he enjoyed nine years flying nearly every model of Bell helicopter. He performed development and certification flights on the Bell Models 430, 427 and 412; flew production tests on the OH-58D Kiowa Warrior; trained pilots from all corners of the globe; flew sales tours in Asia, Europe, and South America; and demonstrated the experimental XV-15 Tilt Rotor in a daily routine with the V-22 Osprey at the 1995 Paris Air Show. During his aviation careers, John accumulated over 6,000 flight hours in 30 models of aircraft. In 2003 he joined Northrop Grumman in San Diego as an engineering manager on Fire Scout unmanned helicopter programs. Since retiring in 2012, John has traveled extensively in Europe, learned Italian, and enjoys sailing, surfing, photography, building aircraft models, and aviation history. John is married to the former Katherine Gay Bowell of Annapolis, and they have two married sons and four grandchildren.